NARIP kicked off its Music Supervisor Sessions with ad agency supervisors last week in New York, welcoming Young & Rubicam’s Executive Producer of Music and Creative Content Jessica Dierauer as the first guest in this 6-part series. Dierauer’s session SOLD OUT (limited space available for remaining 5 sessions). Dierauer browsed through music selections and had positive feedback and practical suggestions for all 15 participants in NARIP’s intimate, limited enrollment session. Participants were sent a brief prior to the session about Dierauer’s current music needs to prepare a pitch. One participant (Freddy Charles) even composed a spot to fit the brief. Based on feedback to their tracks, participants also had an opportunity to edit, revise and re-submit material to Dierauer . This in itself is valuable. When pitching music, the greatest frustration is not even knowing if material has been received, and most supervisors are unable to reply with meaningful feedback given the volume of material they get and tight deadlines they battle. So to receive direct feedback from a “buyer” or licensor like Dierauer, and then have an opportunity to rework a track and resubmit it is a great advantage. Dierauer’s brief detailed a 30-second advertising spot for a food products company and included the script with notations for music. Her brief described the type of music desired, the background and the “players” in the spot which included a mom and two kids. 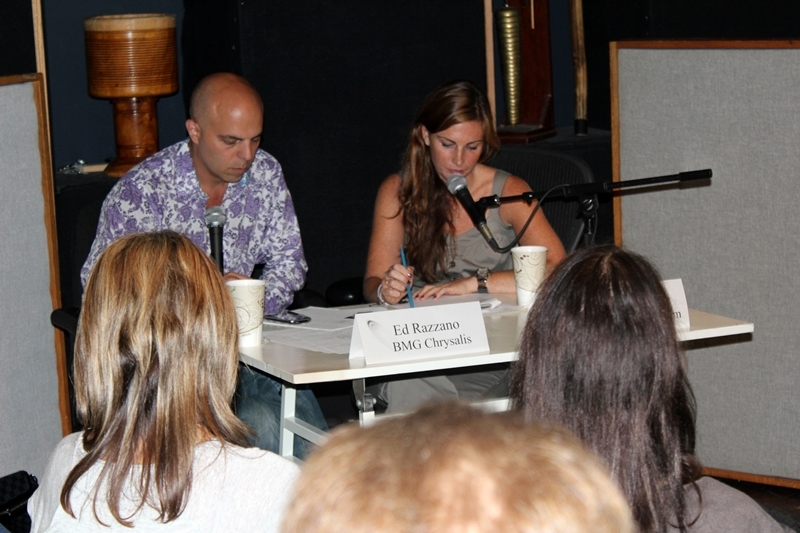 Moderated by BMG Chrysalis’s VP of Film, TV & Catalog Marketing Ed Razzano, the session started out with an explanation of how briefs are created within the ad agency world, to whom they are circulated and when. Typically, said Dierauer, the ad agency will not circulate a brief widely for confidentiality reasons, making it harder for music providers to hit the mark. However, for those to do get access to the brief (as NARIP participants did), it’s important to pay attention to every word and deliver exactly what’s requested. Time and again, music supervisors in NARIP’s series have noted that one of their frustrations is requesting specific types of music and then receiving material in response that doesn’t adhere to the exact requirements they specify. 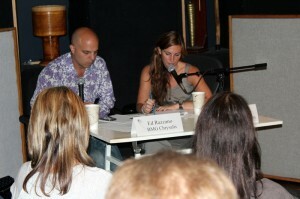 Participants were introduced to the challenges of music in advertising. Presenting music in 15-, 30- and 60-second edits rather than as full songs, which is the norm for film and TV, is tough to do well. Much of Dierauer’s feedback was where precisely within the track she heard the “sweet spot” and how to reach it sooner. While some budgets are non-existent (as in, zero) even in the advertising world, a budget of $100,000 (all-in) for one 30-second spot is not uncommon, with an upper range of $300,000 – $400,000 for “name” artists. This in interesting contrast to the budget of a popular cable TV show – True Blood (HBO) – for which the music budget for an entire 1-hour episode is $100,000, I pointed out. To play the devil’s advocate as publisher of a song, Razzano said that the $100,000 license fee takes into account that if an advertiser’s campaign is successful, then that song will likely not be licensed for other uses because of its strong association to the product. The higher licensing fee is to offset in effect taking the song off the market for a period of time. Also, category exclusivity plays a role in the license fee, he added. This is when the licensor pays an additional fee to preclude other parties or brands in the same category (such as “packaged goods” or “soft drinks”) from licensing the same track within a defined time period and territory(ies). Why product category exclusivity? Because Coke and Pepsi don’t want their competitor to do a parody of their product using the same song, and protection against that is to license the music for category exclusivity, says Razzano. Always, always make sure to include (or have available) instrumentals of ALL tracks. Dierauer indicated that this is one way in which she sorts music is to tag the 3 to 5 most prominent instruments in the track. In the ad world, best edits of songs at 15-, 30- and 60-second mark are important. Ads typically don’t use an entire song, but only portions thereof (ads are usually only 15, 30 or 60 seconds long). Therefore it’s advisable to cut out long intros and get to the hook or essence of the song, and have edits available to suit these three timings. The importance of metadata – once again – was emphasized. Please include it. Dierauer emphasized how useful this can be. See list of important metadata categories below. Also discussed was most favored nations (MFN), a term found in agreements which means that the recipient of this treatment must receive equal advantages (usually pro-rata licensing fees) as the “most favored nation” by the party granting such treatment. How does this translate into music licensing? If you own [or control] only one piece of a song (either the publishing or the master or a portion thereof), it’s advisable to request MFN language so that your pro-rata portion of the fee will be equal to the others, recommends Razzano. Quotes are typically based on 100% of the underlying composition. Audio from NARIP’s session with Jessica Dierauer available, click here to buy now. To Gail Vareilles’ Wonderful Thing: “A really fun track, would love to hear instrumental. The ‘wonderful thing’ and ‘love’ vibe hits a lot of briefs I get, so it’s really useful. I have playlists for that. To Freddy Charles’s Carwash: “Cool, definitely very cinematic, took me into ‘Big Fish’ territory – it has a sense of wonder and it’s cinematic and fun, but is missing tension.” Based on Jessica’s feedback, Freddy reworked and re-submitted the track to her. From Richard Khuzami: I found the session interesting, and friendly. I applaud NARIP in establishing these sessions! From Gail Vareilles: Such an amazing night and I so appreciate all your efforts in making it happen. I have been to many such events in the past where I had the opportunity to meet some major industry leaders but have never felt this kind of intimacy and accessibility- and came away feeling like I really made a super connection in the industry. Even the little details did not go unnoticed- how you seemed to remember everyone’s names and make us all feel special. Jessica Dierauer was lovely and approachable and honest and of course Ed Razzano is the perfect host with his warm sense of humor and great knowledge of the business to share with us all. I learned a lot and will now sign up for all the other sessions… A million thanks, it was aces and I can’t wait for the next one! Update from Gail Vareilles on Tue Sep 20: At Jessica’s session I gave her a CD with 30 and 60 second clips of some of my songs. Her assistant emailed me yesterday (before I even followed up!) to say that they can use some of my tracks and needed some metadata (another lesson I learned at NARIP’s session about imprinting metadata onto all tracks!). So we are back and forth and I am thrilled to have made such a great contact in the ad biz because of NARIP. So how can I not attend all your amazing sessions knowing I will make such high level contacts that would have been very difficult for me to have made on my own? …I can’t wait for the next session! From Dave Liang: Was lots of fun and learned a ton of new things. Both Jessica and Ed were great. I like how all of you are mindful of folks who might not be that familiar with the industry and always provide explanations of definitions that may not be as widely known. Also, the anecdotes (e.g. Serge Gainsbourg’s daughter rejecting AXE) are priceless. Thanks again for coordinating these wonderful sessions. I will highly recommend to others. From Sarah Nagourney: It was really great. Will attend the ones [sessions] in October. Jessica was really lovely and everyone was so talented. From Jacob Weinreb: I found the session extremely interesting/helpful, and I look forward to attending the rest of the series. Thank you for all of the work you’ve put into these. From Freddy Charles: I really enjoyed the event and definitely see the value in the intimacy of it. I’m on board for more as well as doing some LA stuff and possibly London. Anyway, thanks again for creating such a nice opportunity and I look forward to continuing with the sessions. Get more details and register NOW at www.narip.com. These categories of metadata are typically associated with each music release. The more you can manage, track and keep this information organized (and have it instantly accessible and/or embedded in tracks themselves), the better. It is easy to embed metadata into MP3s using iTunes, and various other simple apps exist as well. NOTE: some of these fields refer to albums rather than tracks, but always include as much info as you can, including contact details. – Any special attributes of the track such as “swells at :20 mark” or “key change from major to minor at :46” or “anthemic” and other distinguishing characteristics or emotional moods of the song. NARIP. Get connected. Stay connected.